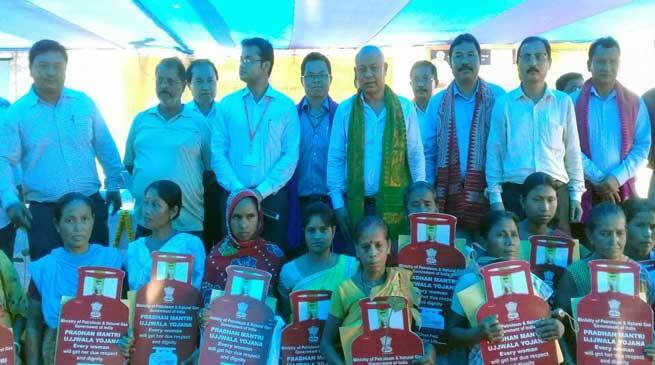 The Chief Executive Member of Bodoland Territorial Council(BTC) Hagrama Mohilary today launched the Pradhan Mantri Ujjwala Yojana (PMUY) in Kokrajhar, at a ceremonial function held at Bodoland Guest House in Kokrajhar. As a symbolic launch of the Yojana, 35 beneficiaries were handed over LPG connections to the beneficiaries. BTC executive member Dhaneswar Goyary, MLA Rabiram Narzary, Kokrajhar Deputy Commissioner Bibekananda Choudhury and officials from IOCL were also present in the meeting which was chaired by BTC Principal Secretary Biren Chandra Phukan. The PMUY is an ambitious social welfare program of the government of India, launched by Indian Prime Minister Narendra Modi in 2016. The objective of the program is providing 5 crores LPG connections to women from families Below Poverty Line. The scheme is aimed at replacing the unclean cooking fuels mostly used in the rural India with the clean and more efficient LPG, so that they don’t have to compromise their health in smoky kitchens or wander in unsafe areas collecting firewood. Expressing gratitude to PM Modi for launching the people-oriented scheme, Mohilary said the scheme would benefit the people immensely as more than half of the population, especially in the rural areas, still use firewood for cooking.